You must include dynamic core exercises into your workout, if you want to increase your speed, power, and sports performance. 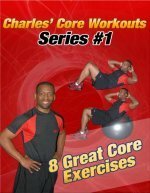 If you've read my page on Core Exercise for a Better Body, you understand that exercises can focus on stability, strength, or power. Stability exercises keep the spine still. Strength exercises work through a full range of motion, and Power Exercises are fast. Why do exercises in a fast and explosive manner? There is a term in personal training and rehabilitation called functional training. Functional training simply means that you train in a way that closely simulates the activity you want to get better at. If you want to get better at biking, you need to ride a bike. If you want to get better at swimming, you need to swim. If you run all the time, you won't get much better at swimming. If you analyze sports moves, you'll notice they are done really fast. When lifting weights, you generally move in a slow and controlled way. But sports are not slow and controlled. This is one reason why people who work out in gyms get injured when they play sports on the weekends. In the gym, they train their body in a slow and controlled way, and the body is not prepared to move in a fast and uncontrolled way. The answer to this dilemma is to incorporate exercises that improve speed and power if you're going to participate in sports recreationally or competitively. I like NASM's approach to developing speed and power. The National Academy of Sports Medicine utilizes medicine balls and jumping exercises to improve core power and speed. To improve core power and speed in the upper body, you would throw a medicine ball against a wall, on the ground, or in the air. Since all movement is generated from the core, adding a medicine ball teaches the core muscles to react fast and explosively. When you throw a medicine ball, your core muscles learn to quickly transmit the force from your core to your arms. My favorite medicine ball core exercises are the over head soccer throw from a standing position, and the over head throw from the crunch position. If you're in any throwing sport or a sport that uses a ton of upper body, then it is important to use a medicine ball. In regards to jumping exercises, my favorite exercises are medicine ball squat jumps and tuck jumps. Although it may seem that jumping exercises are lower body and throwing exercises are upper body, remember that all movement is initiated from your core. When you throw a ball, your core muscles really work to generate your power and speed. When you jump your core muscles, really work to generate speed and quickness. Dynamic core exercises are an essential part of any athletes training regimen. If you are participating in sports recreationally or competitively, incorporating core power exercises will decrease your chance of injury and improve your speed, power, and performance.